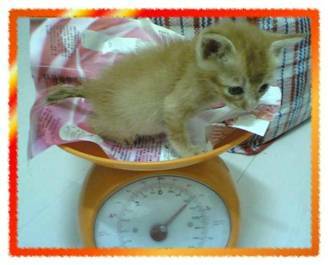 Yoyo was the second abandoned baby which I rescued in our school area. She was only 3 weeks old when we first found her. Her big blue eyes immediately captured my heart, although she was at first taken care of by a janitor. Feeling that it was a hassle to nurse such a small baby, the janitor finally decided to give her up to me. I was so elated when I could at last bring her home! Yoyo at 1 year old. She’s now 5 years old. She has marking of a pair of lovely angel wings on her back. The third and the fourth stray babies I adopted appeared to be from the same litter and they came home together. The one on the left is a brown classic tabby while the one facing us is a brown mackerel tabby with white whom we’ve been keeping these years. He is called Fung Fung. Urged by a student of mine, I gave the classic tabby to her. Sadly, he didn’t make it through and died 2 weeks after the adoption. 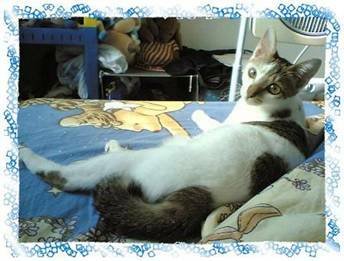 Fung Fung, with my experience of handling stray babies, managed to survive in our home and has now grown up to be a very affectionate cat which loves to be cuddled and patted. 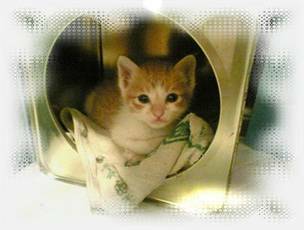 The fifth kitten I rescued was a red tabby white. He and his brother were found by some students of mine. At first, I urged a colleague of mine to nurse them both. Nonetheless, lacking experience and confidence in dealing with such young babies, my colleague requested that I nurse one baby for him until he was about 2 months old. I agreed to this suggestion. This baby was finally named ‘Justin’ by my colleague while his brother was named ‘John’. I kept Justin in a cage for fear that he would get hurt /lost staying in my spare bedroom. 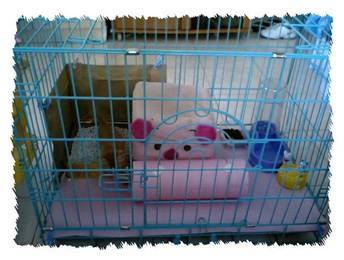 He had a cake tin lined with a towel as a comfy ‘bedroom’ in the cage. He looked so much livelier after just a few days I had taken him home! Upon receiving the second vaccination shot, Justin and John finally reunited! They had their reunion in the vet’s and we were so excited when we saw them put together in the same carrying case for the first time! This was such a special occasion that there were me and my husband, my colleague as well as the student who found J&J in the vet clinic. 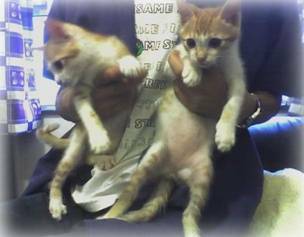 Both my husband and I were so touched to see that the abandoned babies had both grown up to be strong kittens. Having to say ‘goodbye’ to Justin was not an easy task for me. 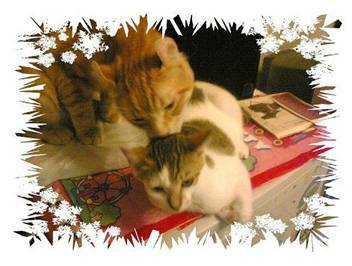 However, knowing that the two brothers could live with each other for the rest of their lives in a loving home, we were rest assured. 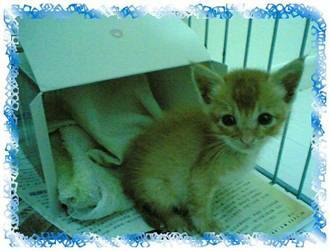 The sixth and the last abandoned baby I rescued was a red one which looked so much like an Abyssinian! I was sure he was over 3 weeks old, judging from his teeth, but this little fragile baby weighed only 230g, which was seriously underweight and undernourished obviously! Being more experienced now, I did all the essential things for this baby first and fed him with AD (a kind of canned food from the vet) plus milk formula alternately. At that time, I wasn’t sure whether he could make it because he looked so vulnerable. Since he was found by students of mine on a rainy day, I named him ‘Rain’. Rain was gaining weight eventually because he was so determined to live on! 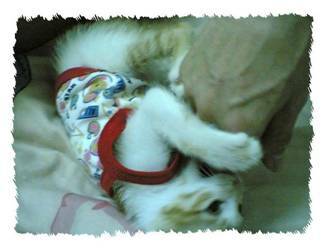 He ate crazily whenever at meal times and I had to make sure he would not choke himself. After a few weeks, he became so strong that he was ready for the first shot, which means he was ready to leave me as well. I relocated him and found him a loving home. My friend agreed to keep him and the picture above shows you what Amy and I had prepared for him. I let the small litter box and the pig cushion from my home go with him to give him some comfort. Sadly, Rain escaped one day from my friend’s home! My friend’s mum was the saddest because she liked him so much and regarded him as her little baby. I felt very upset and shocked at the news as well. Just hope that Rainy has found another sweet home by himself and is well nursed in his new home! So, this is the end of the story of my rescue experience. You may wonder why I have stopped rescuing abandoned babies in my school area. Well, this is because I think I have had enough already. Nursing these abandoned babies was too exhausting and tense for me. 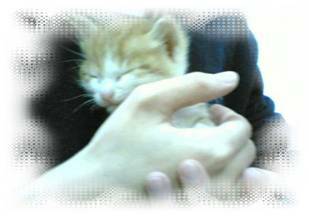 First, I was so scared that these little babies would carry some infectious diseases which could be spread to the cats in my home, which would then be unfair to my cats. (Oh! 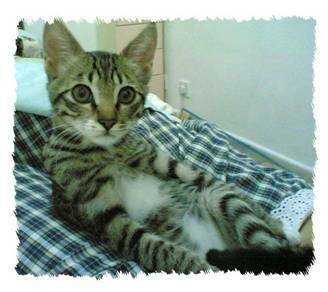 I know you may call me ‘selfish’….) Second, it was a very tough job all by myself. Therefore, after I had decided that I would cut this off, I set up the Pet Club in my school, thanks to the consent of my principal. I decided to instill the concept and knowledge to the younger generation who care for little animals and are willing to learn about them. 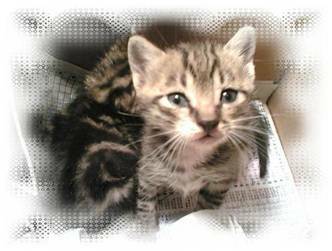 That said, surprisingly and ironically, there have been very few abandoned babies in my school area since the setting up of the Pet Club! My Pet Club members are taking care of a few stray adult cats which have decided to stay in our school area, though. This seems to be good news, doesn’t it? 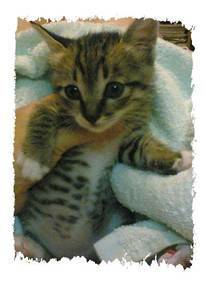 I used to rescue stray/abandoned babies before I became a breeder. This all started 3 years ago. One day there was a barely about 10-day old kitten which survived after a thunderstorm in our school area. That poor little baby was the only survival in its litter. Its eyes were still tightly closed when I first saw it. As nobody took care of it, I took it home, kept it in our spare bedroom and tried to nurse it. 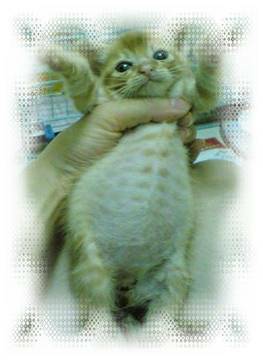 I needed to bottle feed it with milk formula for kittens and helped it to excrete. But I was totally inexperienced at that time, so I had to ask for advice from cat friends as well as look for info on the net. Unfortunately, the baby couldn't survive for more than 3 days, although I was pretty clear about this because when I was feeding it with milk, it was still crying loudly, as if it were unable to drink the milk, and even when it could, it drank so slowly. On the third morning when I woke up, I found that it was lying dead in its little warm bed, with its tongue out. I was so upset at that moment. It was the first kitten I tried to rescue but it was a total failure. I blamed myself for not having taken the best care of it, although everybody I knew around me comforted me that it was too difficult to try to raise an abandoned baby which still has its eyes closed. That morning when I got back to work, I couldn't help weeping from time to time. Now, the image of its dead little body is still so vivid in my mind. However, I hope it is now living a peaceful life on the rainbow bridge.